Distributed energy resources (DER): either you love them or you hate them. The technology empowers formerly passive customers to take their energy futures into their own hands, but DER also challenge utilities to move away from a world where they once held reign as a monopoly provider in a system where power flowed in one direction from centralized power plants. Energy market evolution is accelerating in a direction that relies heavily upon DER, whether those resources generate, consume, or store electricity. Until recently, the software controls that could aggregate and optimize this rich diversity of potential grid service assets was lacking, too expensive, or a proprietary commitment that may have precluded innovation in an ever-changing market. The enhanced capabilities of software become evident when considering just how far virtual power plants (VPPs)—real-time aggregations of customer-owned DER providing value upstream to the power grid—have come based on early experiments first conducted over a decade ago. Where VPPs can take the market in the coming decade is an open question. What is the scale of this opportunity? The chart that follows depicts the key components of the DER landscape as forecast by Navigant Research. Note that, by 2025, this resource pool will reach over 350,000 MW annually. VPPs have expanded in ways that were not possible just a few years ago, with the capacity to identify and control literally millions of grid resources, incorporating larger assets at commercial and industrial (C&I) sites and extending all the way downstream to smart thermostats and solar PV systems in homes. These resources can now be fine-tuned on an ongoing basis based on real-time status, cost, and other factors. The ability to access more DER assets is possible due to machine learning, also known as artificial intelligence (AI). This underlying principle supports a continuously improving asset performance model. For example, new software from Enbala Power Networks can represent the real-time status of an unlimited number of assets available for VPP aggregations. By minimizing or eliminating the need to perform process engineering at every asset site, the software allows for VPP projects to start out small and then grow incrementally. The platform itself can be rapidly deployed in the cloud, giving users control of their assets in a matter of weeks. The VPP offers one path forward in creating mechanisms by which the physical properties of electric current are managed in a safe and reliable way. If designed intelligently and implemented via software platforms that can accommodate DER complexity, a VPP can help foster a system in which a full portfolio of grid services can be provided by the same DER components that were once feared to be the primary contributors to grid imbalances. AI technologies are a game changer in the world of DER. Incorporating self-learning systems in the management of diverse DER portfolios opens the door to new creative synergies between a single resource and its relationship to a network of resources, all marshalled via smart software to support a cleaner and more efficient power grid. At the most basic level, transactive energy (TE) involves the free communication of information among parties, allowing them to enter into energy service exchanges. VPPs and TE are similar in that they place prosumers—formerly passive consumers that now also produce energy—front and center in an emerging market for grid services delivered by DER. The VPP model presents a compelling vision of the future, as does TE. When combined, new revenue streams for diverse energy market stakeholders are inevitable. In the new Navigant Research report, VPP Transactive Revenue Streams, I identify six grid services that could be enhanced by integrating TE within the VPP framework. Localized Clean Energy: How can previous policy vehicles such as net metering and feed-in tariffs be accommodated or revised (or eliminated altogether) to shift from subsidy schemes to a more transparent market locally, regionally, nationally, and internationally? TE platforms operating within VPPs may be a good starting point to explore how to move in this new direction. Virtual Capacity: Just as consumer supports need to be revisited for solar PV and other distributed generation, so do somewhat arcane assumptions governing determinations of resource adequacy for wholesale system planning. Perhaps exit fees and demand charges are obsolete in a DER-rich future. What are new ways to monetize the actual non-generation related services a power grid provides? Real-Time Demand Response: More sophisticated, load-based demand response will be part of the toolkit to displace ramping fossil fuel generators up and down in response to variations in solar and wind. Harvesting load will be one of the key innovations to benefit from TE-based blockchain ledger systems. Fast Frequency Regulation: While the VPP seeks to provide creative fast frequency response, the sources of such services are still often spread far apart. 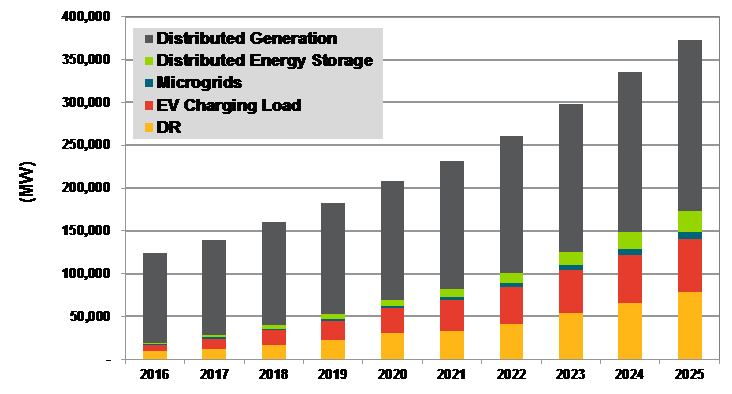 In an ideal world, localized generation, energy storage, and load could be marshalled to address frequency challenges to the grid. Smart Voltage Control: The proliferation of smart inverters onto the grid represent a rich resource portfolio that can be monetized in multiple ways. TE trades would enable a similar value proposition as fast frequency response. Big Data from Small Sources: A VPP supported by TE must rely on accurate and timely data, analytics, and insights. Management of this data may well be the largest revenue streams flowing from the digital grid utility transformation. What happens when a multinational corporation from Europe teams up with a software innovator from North America? The world will soon find out as ABB, long a leader in distribution infrastructure hardware, partners with Enbala to create a DER management system (DERMS) solution that will have wide-scale utility applications. The collaboration is designed to build upon the critical functionality embedded in ABB’s advanced distribution management system (ADMS). This ADMS will serve both as a single network model and as the unified geospatial control center for the new DERMS solution offering. Provided by ABB and layered on top of this foundation will be Enbala’s Symphony software, which will reach out to the DER universe to pull in resources as needed. In short, this collaboration could bring VPPs to the next level. Do VPPs create opportunities for TE revenue streams, or vice versa? Most likely, these two DER platforms will evolve in parallel. DER management systems that can harmonize VPP and TE platforms must incorporate market pricing mechanisms to reflect the changing value of millions of connected endpoints throughout the day. That’s a supreme challenge, and also translates into a major revenue stream opportunity for the Energy Cloud ecosystem. Either way, utilities must also march forward with platforms to manage DER, whether seeking to optimize VPPs, integrate an Internet of Things approach, or develop islands of power with microgrids. The broad concept of DERMS appears to be a compelling solution. To find out more, tune into Navigant Research’s webinar on August 15, featuring both Enbala and ABB. Peter Asmus is a principal research analyst contributing to Navigant Research’s Energy Technologies program, with a focus on wind energy as well as emerging energy distribution networks models such as nanogrids, microgrids, and virtual power plants. His expertise also includes wind energy, marine hydrokinetic technologies, and renewables generally. Asmus has 20 years of experience in energy and environmental markets, as an analyst, writer, and consultant. Asmus is the author of four books covering key energy market issues: Reaping the Wind, Introduction to Energy in California, Reinventing Electric Utilities, and In Search of Environmental Excellence. He is a frequent speaker at industry conferences and he is quoted regularly in major publications including The New York Times, The Washington Post, The Christian Science Monitor, and Reuters. Prior to joining Navigant Research, Asmus was president of Pathfinder Communications, and was previously editor of the Clean Power Journal, assistant editor of California Policy Choices, and has written for a number of energy trade publications including Windpower Monthly and Electric Utility Week. He holds a BA in journalism from the University of Wisconsin.